Garlic is one of those tricky kitchen essentials. Where do you keep it? What does it go with? How long does it last in the refrigerator? The answers of course vary. Garlic works best at room temperature (fridge storage is not recommended), and what it goes with depends on where you are going! As in, better check with your date first. As for storing the stinky rose, there are better options than leaving it out on the countertop or tucking it away in the cupboard. 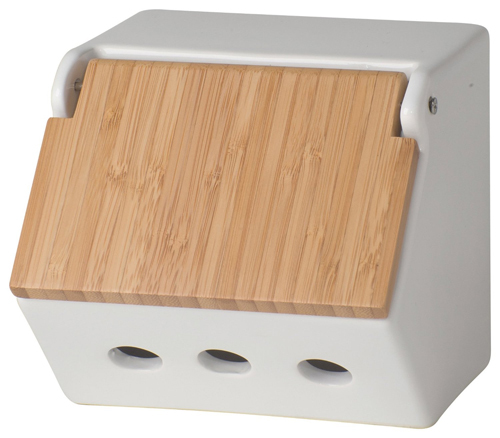 The Now Designs Takenoko Garlic Keeper is a classy mailbox for garlic that can be kept on the counter or mounted to the wall. Large enough to hold several bulbs, the garlic storage solution is an ideal addition to any house. Certainly better than an old shoe box — that wonderful garlic smell doesn’t need the competition.